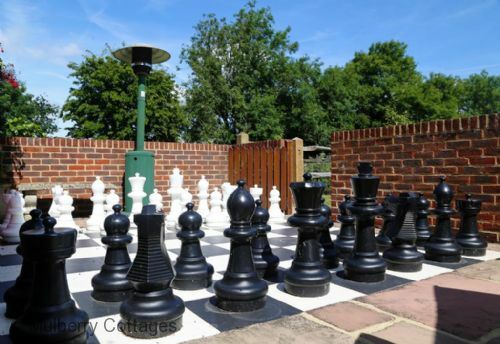 This beautifully furnished self-catering holiday, near Maidstone in Kent, is finished to a luxury standard with a mixture of traditional and contemporary furnishings. The open plan design incorporates the kitchen, living and dining space and makes this cottage a very social place to be whether holidaying with family or friends. The contemporary glass staircase leads you to two stylish bedrooms both with beautifully fitted en-suite shower rooms and overlook the surrounding countryside. Just a short drive from the vibrant market town of Maidstone and less than an hour's drive from London, this cottage in Kent combine the beauty of the Kent countryside with the transport links close by so that you can enjoy the whole of the South East. 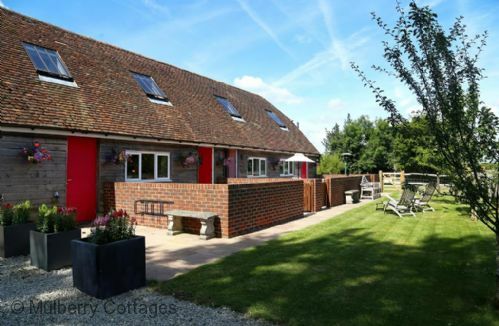 Honywood Cottage is a very special holiday home in Kent and would make an ideal destination for long vacations and short breaks throughout the year. 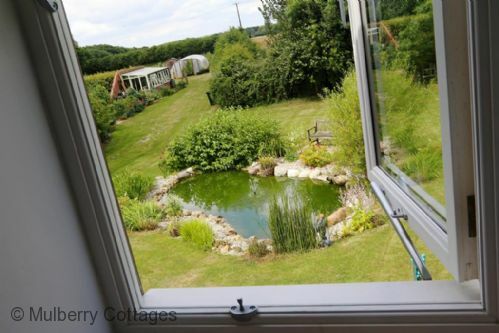 Honywood Cottage: sleeps 4 + 1, 1 reception, 2 en-suite shower rooms. 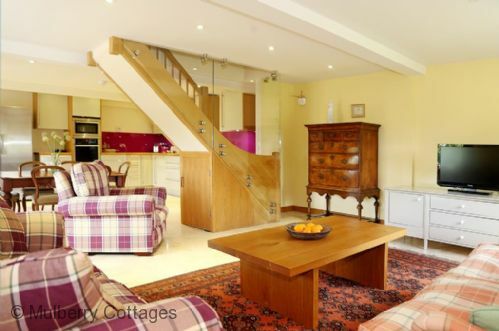 Open plan living space, including kitchen, diner and sitting room. Kitchen area, electric oven, halogen hob, extractor fan, American fridge/freezer, microwave oven, dishwasher and washing machine. The dining table sits centrally to the kitchen area, seats 6. The sitting area, sofas and chair seating for 4, Flat screen TV and DVD. A modern glass staircase to the middle of the open room leads to the first floor. 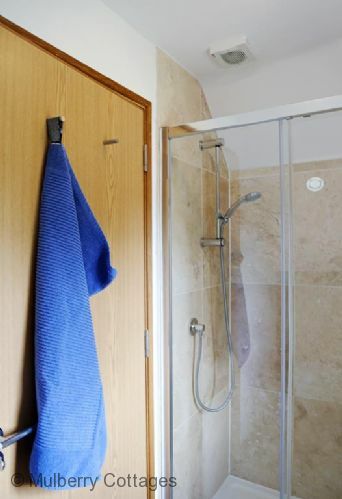 2 x double bedrooms (both sleeps 2) in king size beds, both with en-suite double size shower rooms. Z bed available for a child only. 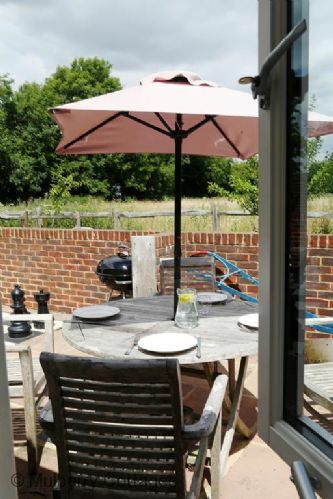 Terrace area which overlooks farmers paddock, table, chairs and parasol to seat 4 plus BBQ. The cottage is accessed via a winding country lane, onto a gravel driveway with space for parking several cars. Combination of underfloor and central heating. Perfectly situated for Faversham and Maidstone and only a short distance from Ashford International where the Euro Star will whisk you away to Paris within 2 hours! Explore the open Kent countryside peppered with footpaths and visit the many charming pubs. Further afield from this holiday house there are wonderful Kent gardens to explore including Goodnestone, Sissinghurst and Great Dixter. Beautiful property with excellent facilities. Beautifully appointed cottage in every way - thank you for a lovely stay. We LOVED this cottage! Homely, luxurious and cosy. Great touches left by the very friendly and helpful owners (along with their cute dog, Dizzy!) and the welcome food was a yummy bonus! We will be recommending to all our friends and we will return! Fantastic stay at Honywood Cottages - wish we had found it before! What a lovely week!! My wife wants to move in there! 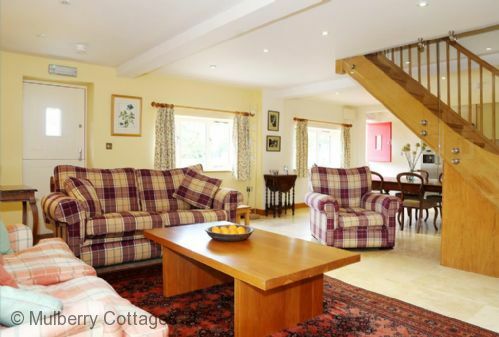 A lovely, comfortable and well appointed cottage, with owners who made us feel very welcome. We were delighted with our visit, and would love to return. Welcoming, spacious and charming cottage fully equipped with a lot of taste. 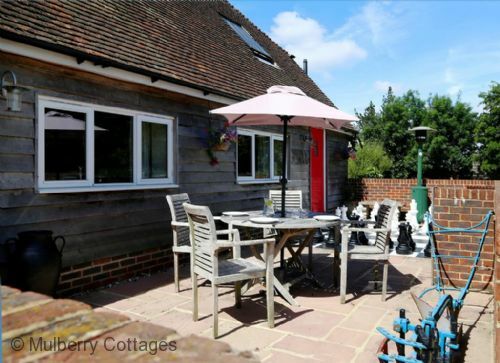 The cottage is located in a secluded area, 3 minutes drive from Lenham - a lovely village with all facilities you need. 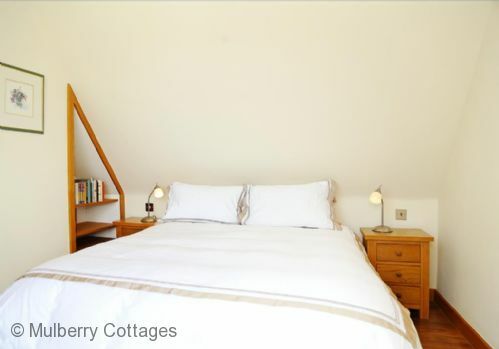 The owners of the cottage are lovely people, friendly, welcoming and want to make your stay a success. 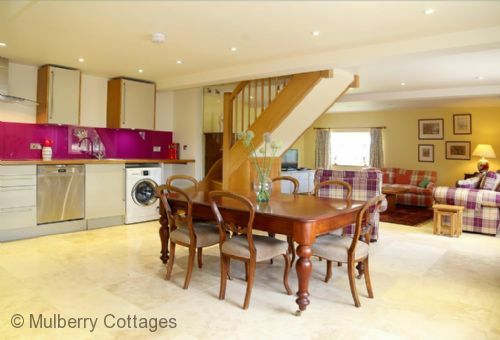 The living room/kitchen and dining room area is large and the rooms are both en-suite with. The cottage is brand new and the fit-out is perfect and modern. The beds are very comfortable. All-in-all a perfect place to relax. I would give you 10/10 for service and courtesy. You were always available and accommodating despite the time difference. Thank you!! Lovely property! Modern, spacious and in a beautiful location. Thoroughly enjoyed our stay. Low occupancy discounts available - please note 1 bedroom will only be available if applied.